So... your pet is wearing some new cologne. Cologne that lasts and lasts and lasts. 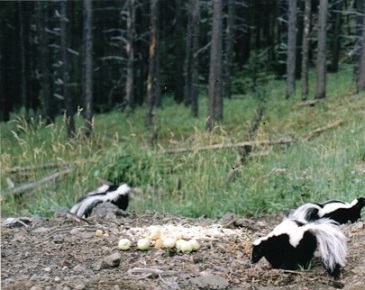 There are a variety of products on the market that guarantee the removal of skunk spray. Unfortunately, the stores that carry them are usually closed when your pet meets a skunk. I developed this skunk recipe and use it in my grooming shop. I am now passing it on to you. I hope it helps! The spray is very oily and for any episode, the crucial part of de-skunking is rid the fur of the greasy properties of the spray. Time is of the essence. My skunk recipe uses products most homes have in the cupboards or are available at your corner store. The longer you leave the pet skunked, the harder it is to remove the smell. Often times, the smell doesn’t completely disappear until the stinky family member sheds. Treat only the areas that have been sprayed as you can spread the smell throughout the whole body. Keep pet out of the house and off furniture until you have all the ingredients of the skunk recipe ready. If your fur ball has had a face shot, be very careful washing around the eyes. Wear old clothes that you can dispose of after and rubber gloves to protect your hands from smelling like skunk for a few days. Mix vinegar, baking soda and 3 good squirts of dish soap. Add enough warm water to warm solution. Apply dish soap to sprayed areas, before getting pet wet. You can add some warm water to dish soap/degreaser to allow it to spread easily. Apply tomato juice to sprayed areas and leave on for 5-10 minutes. Scrub in vinegar solution and let sit for 5 minutes. Wash with dog shampoo and rinse thoroughly. This solution will sting the eyes. If washing around the eyes, soak a cotton ball in the solution and scrub around the eyes. If smell still persists, repeat above directions. If you happen to have a degreaser for pets at your disposal, substitute degreaser for dish soap. Dawn dish soap is the gentlest available for animals. The dish soap or pet degreaser, will break down the skunk oil that adheres to the fur. Tomato juice neutralizes the smell. Vinegar, baking soda removes the smell. Tomato juice can stain white fur pink.